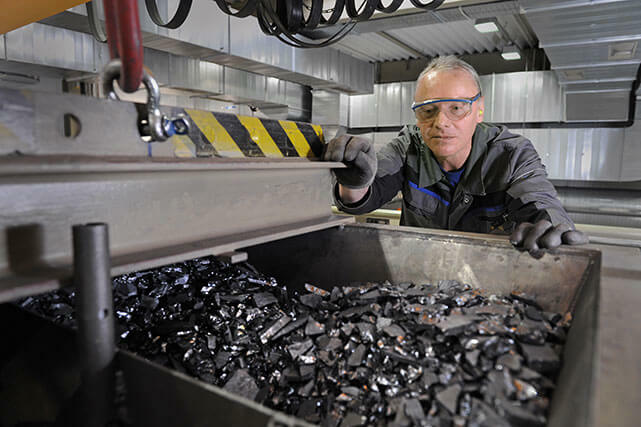 SolarWorld of Germany has voluntarily contracted with U.S. partners to recycle old modules. Green Mountain Power, a local electric utility in Vermont, broke ground last year on a two-megawatt solar farm stretching across nearly 10 acres of garbage, otherwise known as the Rutland City landfill. With more than 10,000 old or closed down municipal landfills scattered across the United States, that’s a lot of brownfield with the potential for no-hassle development. After all, who’s going to raise environmental concerns? But there’s a certain irony to such projects. When the 7,700 solar photovoltaic (PV) panels installed atop the old Rutland landfill reach the end of their operational lives, they could ultimately end up buried in a landfill – or not, depending on what policies and programs are put in place over the next decade to make sure this clean source of power doesn’t become another dirty problem passed on to the next generation. Fact is, solar panels are mostly electronic waste – a mix of semiconductors, wiring and power electronics. In North America alone about 20 gigawatts of solar capacity has been installed, working out to roughly 100 million solar panels destined to become junk in 15 to 30 years. “As the PV market continues to grow, so will waste, even if it only appears after a relatively long time delay,” Queen’s University researchers Joshua Pearce and Nicole McDonald wrote in their still-relevant 2010 paper on solar producer responsibility. By 2020, hundreds of gigawatts of solar systems are expected to be powering the globe, representing billions of panels, some containing heavy metals such as cadmium, lead and arsenic. To put this in perspective, that’s more iPhones and iPads sold globally to date, keeping in mind that as e-waste a single solar panel weighs 600 times more than a typical smart phone. And it’s not just product waste. Green, renewable power may come out of solar modules, but many toxic materials and dangerous processes go into making them. Highly corrosive chemicals like hydrochloric and sulphuric acid, explosive silane gas, extremely toxic tetrachloride, arsine gas and the potent greenhouse gas sulphur hexafluoride are among the nasty ingredients in the solar cookbook. Over the coming years, solar manufacturers won’t just be judged on whether their solar panels are recycled or not. How they manage and minimize waste, how productive they are with resources such as water and energy, and the importance they place on workplace safety, diversity and worker rights will increasingly reflect on the reputations of individual companies and the industry as a whole. 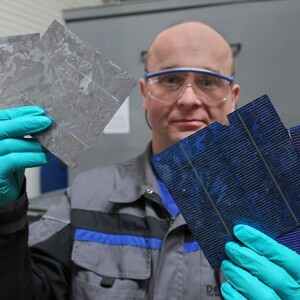 “The PV industry’s continued growth makes it critical that action be taken now to reduce the use of toxic chemicals, develop responsible recycling systems, and protect workers throughout global PV supply chains,” according to the non-profit Silicon Valley Toxics Coalition (SVTC), which reports annually on the sustainability performance of solar module manufacturers. There’s no question of solar power’s green credentials. It is undeniably the world’s cleanest source of electricity, and the solid waste it produces is still tiny compared to traditional energy sources. But its record isn’t completely clean, and as the technology becomes more ubiquitous, it will become more important than ever to shine a light on the darker side of the sun. Shining a light is what the SVTC’s Solar Scorecard project is designed to do. Five scorecards have been released so far. The latest, released last November, was based on survey responses from solar manufacturers and the information they make publicly available. In all, it ranked 37 companies that represent roughly 75 per cent of solar manufacturers. Manufacturers are scored on 12 criteria, including recycling, water use, GHG emissions, chemical reduction efforts, use of conflict minerals and commitment to worker rights, health and safety. Transparency, in the form of public disclosure of key sustainability performance indicators, is given heavy weight. Right off the bat, it’s clear that transparency is widely lacking in the industry. Only seven of 37 companies responded to SVTC’s survey questions, and the majority scored less than 40 out of 100 largely because of non-disclosure in public reports. Companies that have been critical of SVTC’s scorecard argue that the results are not a true reflection of their sustainability performance. If true, it’s a good argument for improving disclosure practices. The highest-scoring manufacturer was Changzhou, China-based Trina Solar, which has occupied first place for three straight years. The company scored 80 per cent or higher on 11 of 12 criteria, and achieved perfect scores on eight, giving it a total score of 92 out of 100. Its biggest weakness was related to lack of disclosure around the use of conflict minerals – a major weak spot for the entire industry. Second place went to SunPower, based in San Jose, California. The company scored 88 out of 100, scoring three points less than Trina on extended producer responsibility. Yingli, SolarWorld and REC came third, fourth and fifth, respectively, rounding out a group that SVTC calls industry leaders. 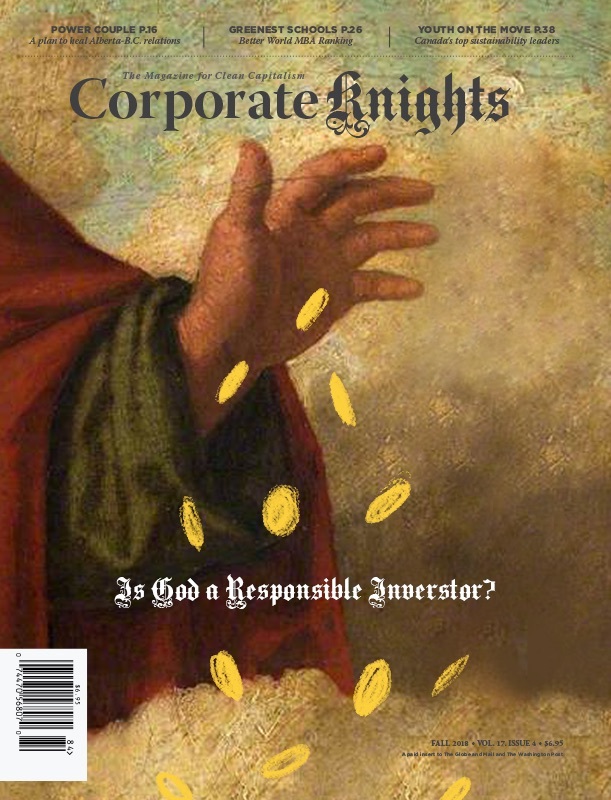 Corporate Knights Capital produced a solar ranking of its own, using a similar methodology applied to our Best 50 and Global 100 rankings. Tempe, Arizona-based First Solar came in first, compared to a still respectable seventh place on the SVTC scorecard. SunPower ranked second on both. Trina Solar came fourth, just behind Germany’s SMA Solar Technology, which makes power electronics for solar PV systems, not modules, so wasn’t ranked by SVTC. The complete excel with all 12 KPIs can be downloaded here. The only Canadian-headquartered company considered by both reports was Canadian Solar, which is based in Guelph, Ontario. It scored only 14 out of 100 on the SVTC scorecard and was off the radar in the Corporate Knights Capital ranking. For socially responsible investors looking to put their money into solar stocks, or solar consumers looking for the most sustainable module manufacturers, it’s not an encouraging sign. Many companies in the industry could certainly do better. One move Canadian Solar did make back in 2009 was to join PV Cycle, a Brussels, Belgium-based organization that supports the take-back and recycling of solar PV modules when they reach the end of their lives. “We continue to proactively take responsibility for developing effective recycling programs,” Canadian Solar founder and CEO Shawn Qu said at the time. PV Cycle is focused only on European countries, and has set up a network of national partners that help module manufacturers comply with European Union e-waste legislation, which in 2012 was extended to include PV modules. Prior to that, PV Cycle was a voluntary industry program. 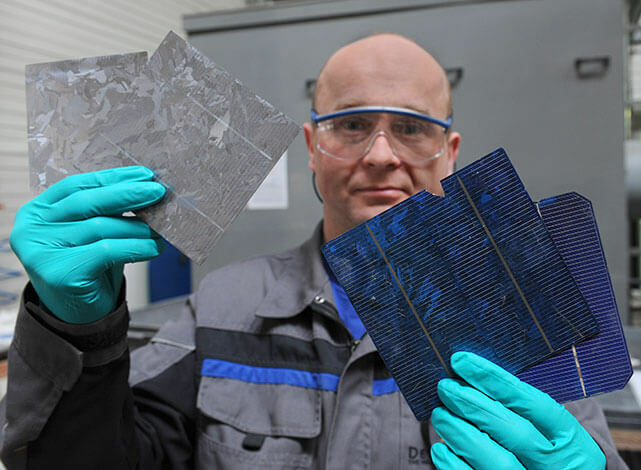 About 11,000 tonnes of modules, more than half from Germany, have been recycled since the organization became operational in 2010. To date, it collects modules from 20 countries through a network of 350 collection points. Its aim is to reach recycling rates of 85 per cent by 2020. While companies such as First Solar and SolarWorld have voluntarily worked to recycle their solar modules in North America, there are no regulations or voluntary industry-wide programs available in Canada or the United States. In Canada, if you’ve got an old panel installed during the 1970s or a newer panel that’s broken, there are no municipal drop-off locations – the likely destination is the dump. But where hundreds of solar panels might have been installed in the 70s, hundreds of thousands have been installed over the past few years, mostly in Ontario. The province’s energy ministry requires developers to submit a Decommissioning Planning Report explaining how materials will be removed from a site when a project reaches the end of its useful life – expected to be 20 to 30 years. In these reports, companies typically promise to responsibly dispose of materials or recycle them “where economical,” but no details or guarantees are given. What are these programs? Who runs them? How can a customer investigate this more? No details are provided – nor could they be. Gorman was in Paris in late April attending an International Energy Agency (IEA) executive committee meeting for solar energy. One of the issues discussed was Task 12, a priority initiative that deals with corporate social and environmental responsibility practices in the solar industry. Out of that initiative, a study to be released in September will look at international laws and regulations around lifecycle management and recycling of solar equipment. Gorman says release of that study will be followed by regulations, which will flow regionally and nationally. “The IEA work on this issue is timely, and will drive environmentally responsible recycling here in Canada,” he says. Putting a European-style recycling program together, similar to what PV Cycle has done, means having enough material to make the investment economical. At the moment, absent of regulation, it costs less for a developer or manufacturer to send PV panels to a landfill. It’s a classic chicken-and-egg dilemma, says Patrick Bateman, policy and research advisor at CanSIA. “Recycling programs, whether for glass, plastic, electronic devices or solar modules, require a business model with a level of profitability to become established,” he says. Consumers and electricity ratepayers, of course, are reasonable people –that is, when good reasons are given and easy to find. 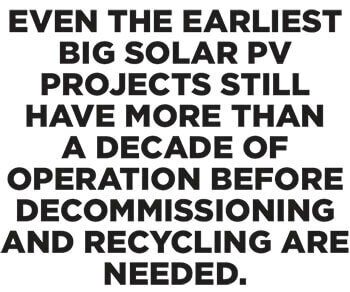 For the North American solar industry, the problem isn’t so much a lack of recycling infrastructure today but a lack of transparency and communications around what that recycling infrastructure might look like, and when it will be developed. CanSIA, which represents the Canadian industry, doesn’t have this information on its website. Solar installers, the first point of contact with solar consumers, are equally absent from the discussion, while most manufacturers – compared to many other industries – get a poor grade on disclosure. Simply put, an industry that thrives on the light of the sun shouldn’t have customers kept in the dark, whether the issue is recycling or sustainability performance in general.